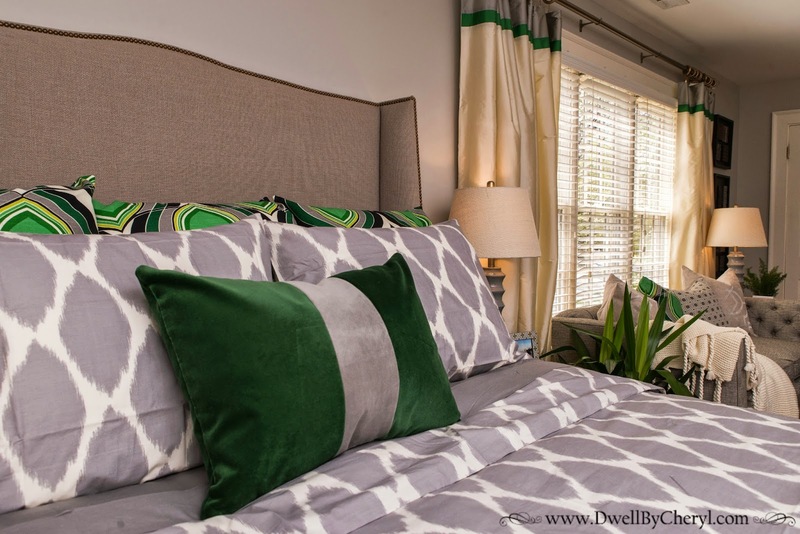 Dwell by Cheryl: Modern Master Client Project Reveal! Well, it's my absolute favorite day, REVEAL DAY! I can't tell you how excited I am to share this project with you. And again, I know I say this every time, but I think this one may be my favorite of all time. I guess if you think about it, that's basically the point; to get better at it each time. I had the best time working with my clients, they were so awesome. Not to mention, very hands off, which I really like. I think they are proof of what you get when you trust your decorator. 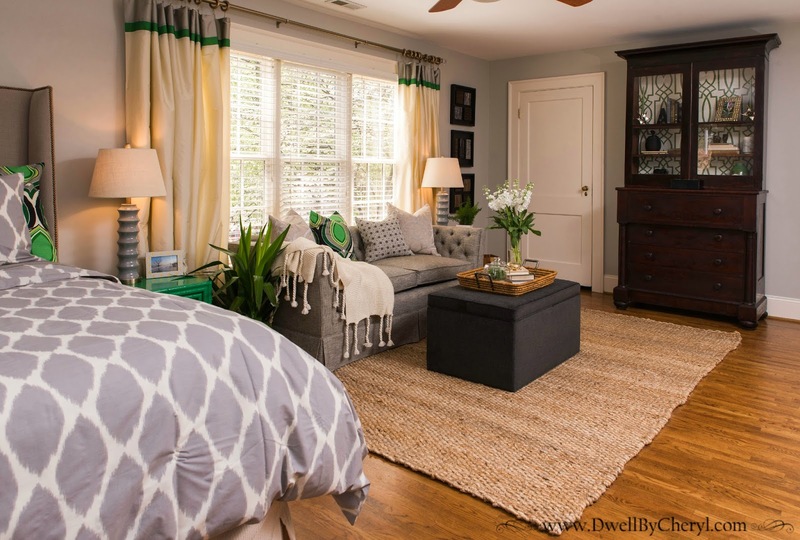 We debated over which space to begin with in their home and settled on the master bedroom. I mean, who doesn't want a nice retreat to come home to? After only being in the home for a short while, the family decided it was best to get some help making their new house a home. We started by giving the space an update with a cool (and very popular) gray called Revere Pewter by Benjamin Moore. The paint color alone did wonders. 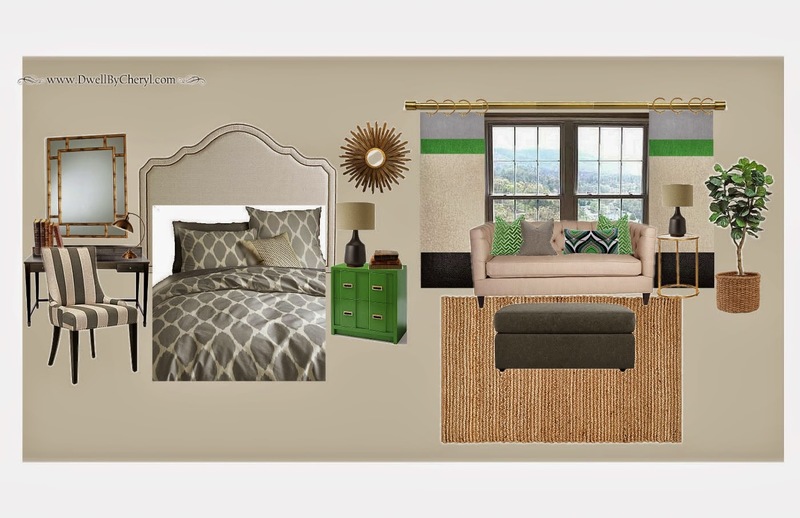 The addition of lush upholstered pieces and accents of green make the space a perfect retreat. 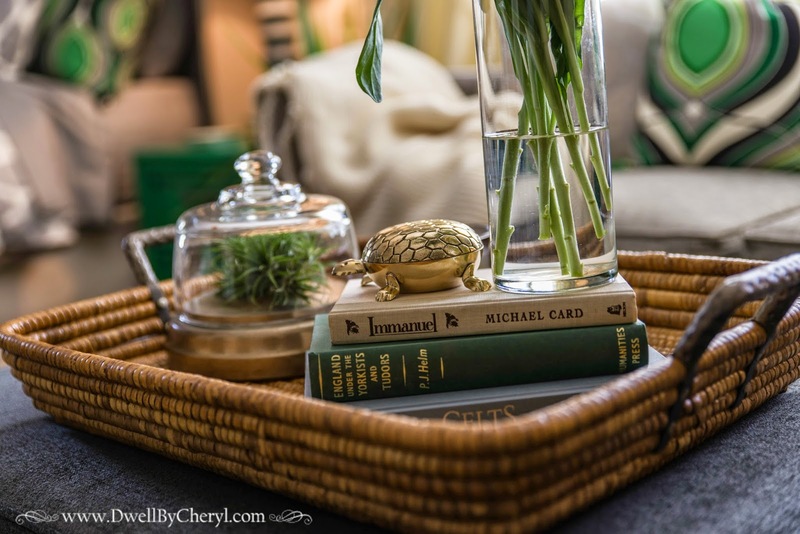 The homeowner's also had some fabulous antiques that I was excited to work into the design. I love mixing in old pieces of furniture even in a modern space. They provide that collected over time look that is so very warm and appealing. I was slightly obsessed with the tall storage piece at the far end of the room. I knew it had promise, but needed a way to make it pop. The power of social media led me to one of my Instagram friends leftover green trellis wallpaper that was the perfect addition to the back of the cabinet. We wanted to make sure we protected the client's family piece so we actually wallpapered cardboard, cut it to size and slipped it into place before reinstalling the shelves. Isn't it amazing what paint and drapery can do? The clients requested a workspace in the room so we added in a killer secretary that I secretly wanted to keep for myself. 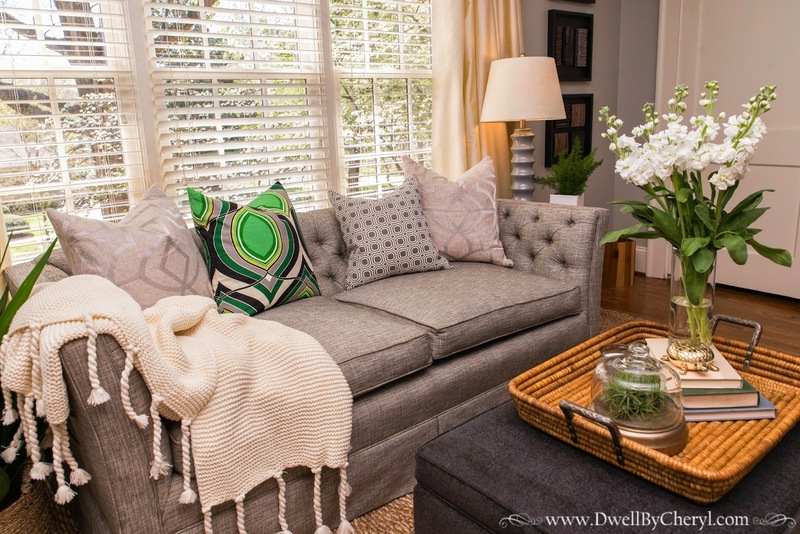 And last but certainly not least is this custom, down, tufted sofa. I mean, seriously? It deserves its own blog post, so I'll be back later this week to tell you all about it. 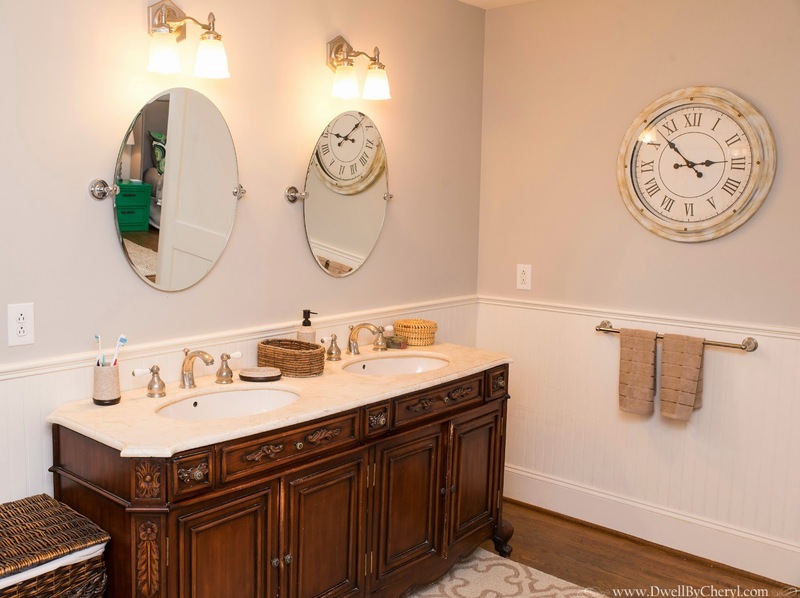 In the adjoining bath we just spruced things up with a fresh coat of paint, new mirrors, accessories and a huge clock that makes a big statement. We're still waiting on a couple of the client's art pieces to be framed for the bathroom. Even still, I think it's a vast improvement. So, what do you think? I'm dying to know if you like this one as much as I do. Drop me a comment below. Gorgeous, Cheryl! It's hard to believe it's the same space. I love your idea of wallpapering the cardboard. Wow!! love the color combination and how you pulled it all together. The space looks larger and so tranquil. You continue to amaze me!!!! Oh Cheryl it looks fabulous! Of course I'm in love with the pops of green. :-) Great job friend! Wow- the power of paint! 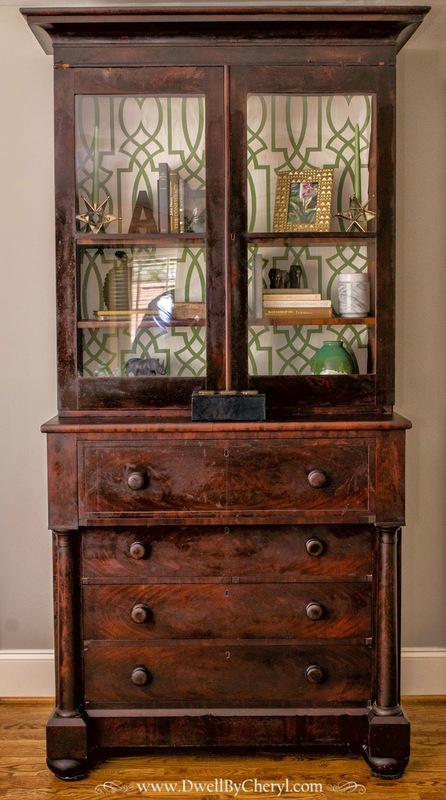 And I love the light trellis print in the back of the cabinet. It really looks like a statement piece now. Bravo, Cheryl, Bravo! The room looks great! And that sofa..owwwwww!!!! 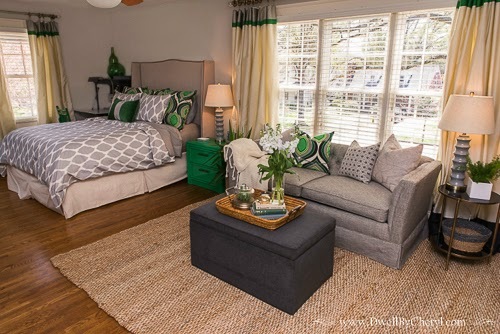 Love the green and gray combo. Great job! Cheryl, this is my favorite room by you!! I love it! 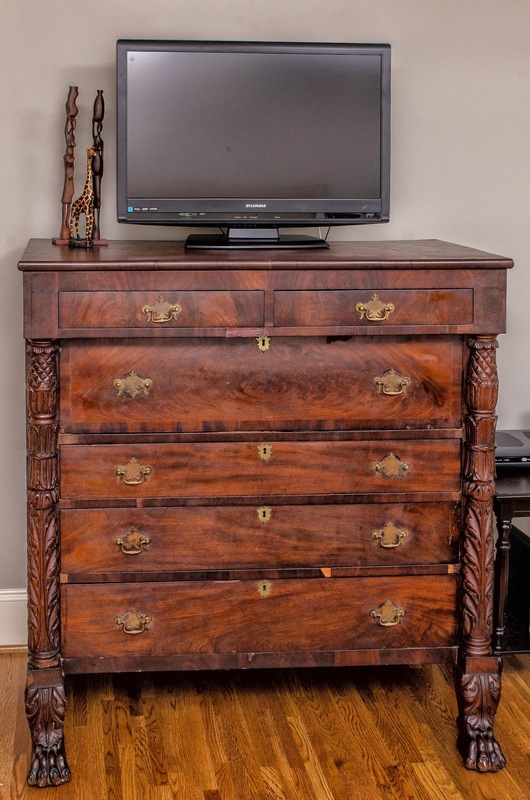 Beautiful existing antique pieces. Nice save with the cardboard. Can't wait to see the sofa post. Great work Cheryl! Your reveal is spectacular. I love the color combos & contrasts...! You will be in high demand soon! If you aren't already!!!! another great transformation girl!!! And you know I love the all that green!! Well done friend! Amazing color! Love the makeover. Really transformational. Your talent is amazing. You did a beautiful job! I love it!!! Love It - absolutely gorgeous !!!!! Will you share the source of your bedding. I love it!